Joseph A. Cabaret, MD Launches New Website | ASTRALCOM - Content Strategy, Conversion Marketing and Customer Acquisition. 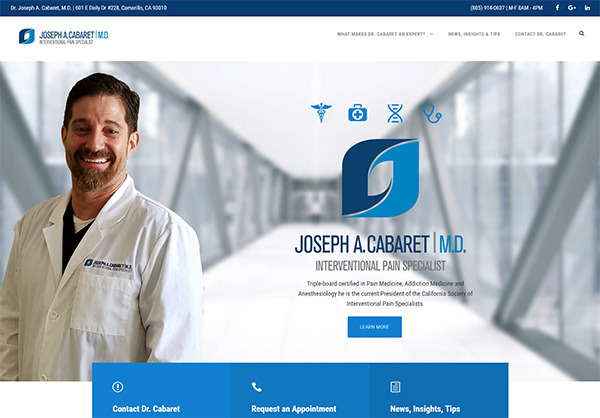 (Lakewood, CA – April 4, 2017) – ASTRALCOM, LLC today announced the launch of the new Joseph A. Cabaret, MD website. ASTRALCOM and Dr. Cabaret began development of the new website in January and worked closely together to ensure that the new website represented Dr. Cabaret and his practice in an appropriate and meaningful way. Dr. Cabaret is Board Certified in Anesthesiology, Pain Medicine, Interventional Pain Medicine, and Addiction Medicine and he is a renowned expert with over 27 years in practice. His new website is now live at: www.drcabaret.com. Part of the mission of the new website is to provide information and education for patients searching for chronic pain treatment options. The website includes articles and posts from Dr. Cabaret, educational treatment videos and in-depth information on Dr. Cabaret’s experience and background. The site is designed responsively so that it can be viewed properly on all devices and includes reviews from other patients and methods to contact Dr. Cabaret directly. “The challenge we faced in this project was defining the navigational flow and creating the content in a way that was easily understandable, informative and encouraging,” explained Richard Bergér, VP of E-Business at ASTRALCOM Integrated Media Services. “Breaking down the medical lingo so that average people could easily understand it was a fundamental aspect of creating the right patient experience,” he added. “Additionally, creating an online experience that helped convey Dr. Cabaret’s expertise, caring and compassion was vitally important,” added Mr. Bergér. “This is why I hired ASTRALCOM,” said Dr. Cabaret, with a big smile. Healthcare digital marketing solutions is an area of expertise for ASTRALCOM who’ve worked for other brands like The Veteran’s Administration, Northwest Community Hospital, AltaMed Healthcare, A Healing Place – The Estate, Casa Pacifica Center for Children and Families and Pacific Clinics. ASTRALCOM Integrated Media Services (www.astralcom.com) is an Integrated Media Services Organization that develops and implements strategic solutions using web, search, social, mobile, content and print tactics and is a multiple award-winning agency named as one of the Top 10 Most Dependable Design Firms in California. Why Are Display Ads So Darn Effective?